Studies have shown that supporting parents in pediatric oncology reduces family distress following a cancer diagnosis. Manualized programs for parents have therefore been developed to reduce family distress. However, these programs have limitations that need to be improved, such as better defining programs’ procedures, developing interventions focusing on parents’ conjugal relationship, conducting rigorous evaluations of implementation, and proposing adaptations to various cultural dimensions. According to the Obesity-Related Behavioral Intervention Trials (ORBIT) model for the development of behavioral intervention, we improved these limitations and developed TAKING BACK CONTROL TOGETHER, a six in-person intervention sessions to support parents of children with cancer by taking the active components of two programs: Bright IDEAS and SCCIP. Referring to the redesign phase of the ORBIT model, this study aims to refine the definition of this program’s design by interviewing parents and healthcare professionals. In order to refine the program, we used a sequential mixed-methods study. Parents and healthcare professionals first completed questionnaires assessing the program, and then discussed its limitations, benefits, and areas for improvement in group and/or individual interviews. We performed a descriptive thematic content analysis of the qualitative data from the open-ended questions (questionnaires and interviews) with NVivo 11 to categorize recommendations for the program refinement. The results showed that components seemed pertinent to final users. The main areas needing improvement were the level of complexity and understandability of the parent manual, the possibility to choose the place and time of the intervention, and the lack of ethnic/cultural diversity. Changes to the program were made accordingly. It is necessary to include end-users when developing complex intervention programs designed for vulnerable populations and sensitive clinical contexts. Following the present refinement, we now have a treatment package, which is safe and acceptable for the target population and has a better chance of yielding a clinically significant benefit for users in a future pilot study. Distress in parents who are confronted with their child’s cancer diagnosis is characterized by a wide range of symptoms such as stress, uncertainty, loss of control, anxiety, depression, and traumatic symptoms [1–3]. According to studies, this distress is related to difficulties in parents’ ability to adapt to the oncological situation and being overwhelmed in the management of daily life [4, 5]. Studies have also shown that mixed parental distress, consisting of anxiety, depression and traumatic stress, is associated with long-term distress and adaptive difficulties in the child himself/herself, as well as impaired school functioning [6–8]. In addition to each parent’s distress, studies have also highlighted the specificities of conjugal distress in pediatric oncology [9, 10]. Parents’ intimacy, sexuality, time, and activities were negatively influenced by the child’s cancer. Importantly, it has been shown that spousal support on the current emotional and conjugal adjustment of each spouse improves the couples’ functioning in both the short and long term . These findings are in line with the reduction in psychological distress and conjugal conflict, and a greater satisfaction with marital life observed among both fathers and mothers who perceived increased support from their spouse . These studies suggest that it is crucial to support parents, treat their distress as early as possible, and promote unity and marital adjustment to maximize family resilience to childhood cancer. In order to evaluate the psychosocial support offered to parents, we conducted a systematic review to identify evidenced-based manualized programs that had been developed, and how they were designed and implemented in pediatric oncology clinics . We identified 11 manualized intervention programs designed to support parents following their child’s cancer diagnosis. These programs followed various models of change including cognitive behavioral therapy (CBT), psychoeducation, and systemic therapy. An in-depth analysis of existing intervention programs, their structure, and tools, as well as their hypotheses of change has highlighted multiple limitations in their definition of a design that needs improvement. On the one hand, a number of programs did not consider extant components with documented implementation and effects. Other programs did not always accurately document how targets and models of change were selected. On the other hand, several programs lacked a design refinement as well as pre-test and test phases that would have improved their acceptability, feasibility, and effectiveness. Finally, the programs were mostly defined for a specific population and were therefore not applicable to individuals from different cultures. This review’s results are available in another publication . Based on this review, we retained two programs, Bright IDEAS and SCCIP, which have the best effects on their primary outcomes and are the only ones recommended by the US National Cancer Institute (NCI) [14, 15]. Bright IDEAS is an intervention program based on problem-solving skills training (PSST). Although Bright IDEAS has excellent NCI scores on dissemination (5/5) and research integrity (4.4/5), this program still bears limitations. Firstly, because it is only offered to mothers and administered individually, it received a limited impact score (2/5). Secondly, because it is relatively burdensome and somewhat repetitive (eight in-person sessions), the dropout rate was high (42%) . SCCIP is based on the principles of CBT and systemic therapy. SCCIP relies on different activities based on family interventions aiming to improve coping and marital/intrafamily communication. For instance, it relies on multiple family discussion groups which suggest conducting a group discussion to clarify parental functions. This activity’s strength is its family-oriented approach which helps families cope with cancer [17, 18]. SCCIP has received fair NCI scores on research integrity (3.6/5) and dissemination (4/5), but a lower score on impact (1.3/5) . The manual remains largely general with regards to the complexity required for communicational interventions in the family and lacks important details about the specific interventions to be carried out. Thus, it is difficult for professionals to use the interventions prescribed by this program in a systematic way. Of note, Bright IDEAS was developed in two languages (English and Spanish), whereas SCCIP was only developed in English. Like the vast majority (8/11) of available interventions, these programs were developed for a North American population which raises questions about these programs’ transferability to individuals who are from different cultural backgrounds or who do not speak English and/or Spanish . Based on these observations, we addressed these programs’ limitations by combining their most effective procedures and translating them into a program better suited for a French-speaking population in pediatric oncology . In order to translate and correctly articulate these programs, members of our team were trained in both programs and met with the respective authors. The resulting program was therefore a new integrative intervention offering an active approach to meet parental needs. Several frameworks have been formalized for optimizing interventions [21–23]. Among these, Obesity-Related Behavioral Intervention Trials (ORBIT) is a complete evaluation model for intervention programs which explicitly describes the preliminary stages of program development . This model consists of four phases: I, program definition phase; II, preliminary tests; III, efficacy studies; and IV, effectiveness studies. Phase I, in which the program is defined, consists of two stages: Ia, the definition, and Ib, the refinement of the design. With regard to the definition of the new program, TAKING BACK CONTROL TOGETHER, we followed the ORBIT phase I recommendations: 1, definition of the target population; 2, selection of the program’s primary and secondary intervention targets of; 3, justification for the choice of models of change and their translation into interventional procedures; and 4, development of a coherent program comprising these procedures . In order to standardize the administration of this intervention, we also created a manual for practitioners and parents, consistent with standard practice in behavioral sciences . TAKING BACK CONTROL TOGETHER aims to strengthen parents’ sense of control and PSST (heterosexual and homosexual couples) and focus on dyadic coping to prevent distress. This program is based on cognitive behavioral and systemic theories. It includes six sessions: four individual sessions, offered to each parent, and two couple sessions (see Fig. 1). The individual sessions focus on PSST, as well as acquiring, developing, and maintaining simple problem-solving skills to meet the needs of families facing childhood cancer. PSST includes six stages: 1—problem selection; 2—problem definition and operationalization; 3—generation of possible solutions; 4—decision-making; 5—solution implementation; and 6—effectiveness evaluation . These sessions take place at the hospital during the child’s treatment. They can also be offered to single-parent families. Both couple sessions are based on CBT and systemic therapy. They aim to enhance parents’ communication and resilience by improving their ability to manage real difficulties associated with childhood cancer together [9, 28]. Couple sessions are provided either at the hospital or at the parents’ residence according to the parents’ preference. In blended families, each parent can participate in the program with their new partner. A manual for healthcare professionals (provider manual) provides specific instructions for each intervention to be used in every program session. Furthermore, the provider manual offers numerous transcripts examples to convey the information to parents adequately and in a standardized manner. A manual for parents includes PSST toolkits for individual and couple sessions, as well as strategies related to communication and dyadic coping. Three illustrations are also available: (1) a video about a canoe trip disturbed by bad weather to illustrate problem-solving steps; (2) a written clinical vignette illustrating an example of how a problem related to a child’s cancer is solved by the parents; and (3) a video in which parents of children with cancer discuss the challenges they face in their conjugal relationship. A complete description of this intervention’s design definition is available in a study report . Following the intervention’s definition, design refinement is an essential step in program development that is also necessary to document. The intervention’s design refinement (ORBIT phase Ib) aims to identify essential treatment components, determine aspects related to its administration (such as its frequency and duration for example), and improve its strength and efficiency . The milestones to achieve in order to move to the following step (preliminary testing of the ORBIT phase II) is to have established the treatment package’s essential components, to ensure that it is safe and acceptable for the target population, and that it is likely to produce a clinically significant positive effect on the target. During these preliminary tests, we will conduct a pilot test which will assess the new program’s acceptability and feasibility. Following these preliminary tests, efficacy (ORBIT phase III) and effectiveness (ORBIT phase IV) studies could be conducted. The study’s main objective was to refine TAKING BACK CONTROL TOGETHER following interviews with end-users: pediatric oncology healthcare professionals and parents of children with cancer. Specifically, this study aimed to (1) evaluate and (2) provide suggestions to improve the program’s relevance, acceptability, material, practical implementation, and technique procedures . We recruited a convenience sample of healthcare professionals and parents through internal email and online social media, respectively. A post was published on the Leucan Facebook page, a community support organization for children with cancer. The post invited parents to participate in the study and outlined the study’s inclusion criteria. Such recruitment procedure is frequent with populations who are difficult to reach and allows participants to take part in the study on a voluntary basis . To be included in this study, healthcare professionals had to be members of the hematology-oncology staff and have worked for more than a year in the pediatric field. We included one participant from each of the following practices: medical, nursing, social, psychological, physiotherapy, and volunteering team. Parents included in the study had to have a child in remission for at least 6 months and the ability to speak French. The decision to gather experiences from parents whose children are in remission is associated with the desire to evaluate the program’s components with participants who are somewhat at some distance of their experience with pediatric cancer. By having more perspective on the disease, they are able to share the experience they have lived at different times, from diagnosis to remission. Information power was reached through pertinence of selected participants and not by the importance of their number . A sequential mixed-method design was used to assess the program. Mixed questionnaires with closed- and open-ended questions as well as directive interviews (individual, couple, and group) were employed. First, we met healthcare professionals, then we met the parents. Meeting healthcare professionals first and parents second is a decision supported by the criterion of methodological coherence and by clinical evidence. We wanted to have clinicians’ opinion to avoid any inconsistency with the care of parents. Healthcare professionals included in this study were invited to a group meeting involving three steps. The first step was a 30-min information session about the project. Beforehand, they had received documentation on the program to become acquainted with it. The documentation consisted in provider and parent manuals as well as intervention tools. As a second step, they were invited to complete an evaluation questionnaire in paper format (described below). The third step was to take part in a focus group investigating the questionnaire’s main themes and focusing on elements that had been negatively evaluated in step two, i.e., the providers were invited to discuss these elements and to suggest ways to improve them. This focus group was conducted by two researchers (DO, RR), audio recorded and transcribed. After completing the focus group with the professionals, the same two researchers (DO, RR) met with the parents. Given the difficulty of finding a time that suited all parents for a group interview, only individual or couple sessions were conducted. The procedure of these meetings was as follows. Firstly, participating parents were contacted by phone to introduce the intervention and verify the inclusion criteria. Secondly, a brief description of the study, the parent manual, intervention tools, and the parent questionnaire were sent to them by email or surface mail. After having read the documents, parents were asked to complete an evaluation questionnaire in PDF format on their computer or tablet (described below). Thirdly, 1 week after the initial contact and the description of the program, interviews with parents were conducted to discuss both the questionnaire’s results and the comments made earlier by professionals. We also asked for their input as to how to improve the intervention accordingly. When parents were unable to come to the hospital, a 1-h meeting following the same structure was offered by phone. These sessions were audio recorded and transcribed. Finally, after data analysis was completed, the intervention program’s manuals and tools were improved following the participants’ suggestions. Participating parents were compensated for their participation. Healthcare professionals did not want to receive financial compensation for their participation. Therefore, a donation of 30$ was made to an association of their choice. The CHU Sainte-Justine Ethics Committee approved this project. Socio-demographic information was collected for this study. For healthcare professionals, we collected occupation, age, and years of experience. For parents, we collected marital status, number of children, occupation, work status, and the date of diagnosis. The research team also created two questionnaires by adapting questions used in previous studies [32, 33]. The questionnaire for healthcare professionals included 50 items grouped into four categories to evaluate the program’s relevance and acceptability (6 items, e.g., “the program is adequate to deal with difficulties experienced during childhood cancer”), the program material (5 items each about provider and parents’ manual as well as intervention tools, e.g., “the manual provides sufficient information to parents, program tools are easy to use”), the program’s practical implementation (8 items, e.g., “you could invest in the six-week program”), and the expected effects of its procedures (21 items, e.g., “the program would have taught you something useful”). Responses were provided on a 6-level scale, from 0 “strongly disagree” to 5 “strongly agree.” For each topic, space was available to allow participants to write comments. Parents’ questionnaire was the same as the one completed by healthcare professionals with the exception that it did not contain any questions about the provider manual and included more questions about the program’s expected effects. Parents’ questionnaire included 49 items grouped into four categories: the program’s relevance and acceptability (6 items), the program’s material (5 items about parents’ manual and 5 about intervention tools), the program’s practical implementation (8 items) and the expected effects of its procedures (23 multiple choice items and two open-ended items, e.g., “how do you rate problem solving as a relevant skill to help parents of children with cancer?”). The response format was the same as for professionals. Quantitative data were analyzed using descriptive statistics (frequencies) in order to identify and prioritize the critical elements to be discussed in the interviews. Qualitative data from the open-ended questions (questionnaires) and transcriptions (interviews) were processed and encoded using NVivo 11 software by analysts who received appropriate training specifically for this project . An emergent thematic analysis method was used, and the transcript coding process followed these steps: (1) outlining of the significant critical categories for descriptive analysis; (2) encoding of the transcript by two authors separately (DO, RR); (3) completion of two meetings to discuss and evaluate the inter-rater agreement and the themes selections between the authors by consensus (DO, CJB, RR); (4) recoding of the transcript following each meeting, based on established guidelines and code descriptions; (5) development of the hierarchy of the three central themes (parents’ experience, evaluation of the program, suggestions for improvement); (6) reduction and synthesis of the data for each theme; (7) a preliminary drafting of the results incorporating quotes that had been transcribed without the markers of spoken language to allow for a more fluid reading . Quantitative results relate to the average scores of the main topics assessed by questionnaires (total score for each item is 5). They are summarized in a table and presented in context with the qualitative results. The first section of the result from qualitative data is presented in a narrative form. Participants are identified using alphanumeric codes (P1 to P6 for parents and H1 to H6 for healthcare professionals) . Short quotes were embedded in the text in quotation marks, and longer quotes are presented in a distinct paragraph. Six of the 22 healthcare professionals who were invited agreed to participate in this study. In order to have a sample that adequately reflects the diversity of healthcare professionals in pediatric oncology, the researchers ensured the sample’s internal diversity by recruiting a representative from various professions: a doctor (H1), a psychologist (H2), a social worker (H3), a nurse (H4), a physiotherapist (H5), and a librarian of a pediatric oncology foundation (H6). These professionals were in average 48 ± 9.5 years old and had 20.3 ± 8.5 years of experience. Twelve parents responded to the invitation to participate in this study. Of these responses, six parents—two married heterosexual couples (P1, P2; P3, P4) and two mothers; one married (P5) and one divorced (P6)—who had lived through their child’s cancer experience agreed to participate and were included in the study. Both couples were interviewed at the hospital and the two mothers participated by phone, as they were unable to come to the hospital for these appointments. Parents reported an average age of 45.3 ± 8.4 years. Concerning the parents’ professional activities, there were two biologists, one nurse, one specialized educator, one electrician, and one without employment. Parents who were not included in this study (six people) indicated that they lived too far away from the hospital to participate in the research interviews, were no longer interested following the phone call, or did not respond following the mailing of the documents. Both healthcare professionals and parents began by talking about the parents’ experience. In summary, parents reported having experienced a significant shock at the time of the diagnosis, which caused emotional overload and a loss of control. The complexity and quantity of information received by parents also increase this overload and may cause a feeling of uncertainty. In response to this emotional difficulty, some parents reported having used problem- (or conflict-) solving strategies on their own or within their couple. The importance of control in the search for information or in discussions with specialists was also pointed out. In addition, aspects of marital/family coping were raised, such as the importance of maintaining unity and intimacy within the couple, communicating well and sustaining family routines. Time also allows one to adapt to this situation. Responses to questionnaires assessing the program showed average scores for healthcare professionals and parents (see Table 1). As a conclusion to these quantitative results, several topics were raised to be discussed in focus groups and interviews, including the program’s relevance and acceptability, the usefulness and the writing styles of both manuals, the program’s practical implementation, and the expected effects of the procedures on parents. In general, the usefulness of the parent manual was rated very positively by healthcare professionals (M = 4.1/5) and by parents (M = 4.6/5). On the other hand, the writing style of the parent manual was the subject of several remarks from healthcare professionals (M = 2.8/5), while it was rated very positively by the parents (M = 5/5). Indeed, healthcare professionals indicated that some parents in the target population could have difficulties understanding and dealing with the vocabulary, the writing style, and the amount of reading of this manual. 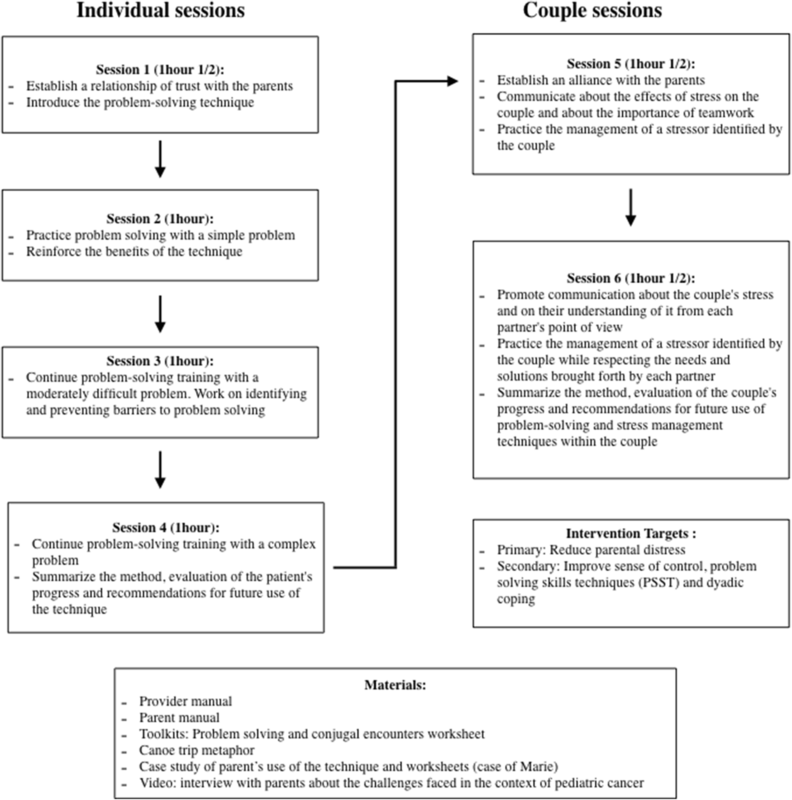 In summary, the interviewed parents highlighted the following program benefits: (1) the relevance of the program’s main target, (2) the complementary of the intervention’s individual and couple components, (3) the training in taking back control over the long term which can be used beyond the cancer context, (4) the relevance of the target audience selection (distressed parents including single-parent families), (5) the program’s manualized aspect (in particular by proposing a manual to parents), and (6) the program provider’s empathetic attitude. According to healthcare professionals, reported drawbacks included (1) the intervention program could be an overload for parents (e.g., completion of homework), (2) the wording of the parent manual is considered too long and complicated in its writing style, (3) sessions at the parents’ homes are not always feasible. In this case, some adjustments will be necessary. One healthcare professional (H1) suggested improving the provider manual by simplifying the technical writing style so that it is accessible to various healthcare professionals (doctors, nurses, social workers). In summary, professionals and parents offered suggestions on improving textbooks, tools and program illustrations. They recommended simplifying the writing of both manuals, shortening, and making them more appealing with illustrations, specifically for the parent manual. Regarding the worksheets, they recommended allowing more freedom to generate solutions without imposing a hierarchization immediately and using codes known by patients as those proposed on medical records in pediatric oncology. As for illustrations, they suggested more clinical cases and better adaptation to the patient’s culture. The Table 2 summarizes the evaluations and the modifications made to the intervention program. Rewrite in a simpler way and create a computerized version and video capsules illustrating the program sessions. The print format will be smaller and include illustrations. In line with recommendations on program development, we refined the design of TAKING BACK CONTROL TOGETHER, a manualized intervention program to reduce parental distress in pediatric oncology [20, 24]. Following data collection, responses to questionnaires and focus groups or interviews with professionals and parents, we identified strengths and limitations, and collected suggestions for modifications of the intervention. The results support the pertinence of the intervention. The concept of the program and its components aim to restore control through individual sessions that offer PSST and maintain unity within parents’ couples by reinforcing dyadic coping and marital communication during the couple sessions. The results also highlighted benefits such as offering emotional support, and an opportunity to take back long-term control, i.e., well beyond the oncological treatments. The benefits also concerned the relevance of offering support for parents with high levels of distress while including single-parent families; and the program’s manualized aspect, which promotes its transmission to healthcare professionals and parents alike. These aspects were considered relevant by participants. They are also consistent with recommendations about psychological interventions in the area of pediatric cancer [37, 38]. Participants highlighted some limitations, including the fact that this intervention could be an additional burden for some, that the wording of the parent manual used a writing style difficult to understand, and was probably too detailed. Participants also questioned the feasibility of meeting parents at home for the couple sessions. Although these limitations did not challenge the acceptability and relevance of the program, they could be barriers to the participation of some highly distressed parents. To address these limitations, modifications were made with respect to the comments and improvement tips provided by the participants. Firstly, the writing style of both provider and parent manuals have been simplified to provide the reader with a better understanding. We removed technical language from the provider manual to make it more accessible for all professionals including nurses, social workers, or counselors. The parent manual text was simplified in its writing to make it more understandable for a wide range of people in Canada whose mother tongue is not French. Consistent with the fact that training in therapeutic procedures requires a therapeutic relationship and active participation, distinct from a teacher-student relationship [14, 27], we removed school-like terms. The parent manual was also simplified, and more illustrations were integrated. The program’s video clips are being recorded in order to propose an electronic version of the manual accessible through a dedicated internet platform, in coherence with other manualized programs that offer computerized versions in the same field [39–41]. Secondly, the “generating solutions” worksheet no longer requires direct ranking from parents. This is required after the generation of solutions. In line with the spirit of PSST , parents can thus search for solutions more freely, without there being a risk of self-censorship linked to a premature evaluation of the feasibility of this type of solution. In fact, PSST including the search for solutions requires the patient to stop and think freely [14, 27]. Thirdly, the canoe trip metaphor and case studies are being adapted to the parents’ cultural background. In order to promote a connection with the illustrations made in the program, it is indeed useful to propose contexts that are close to the parents’ experiences. This way, we are aligning ourselves with the intercultural psychological interventions field, which supports the effectiveness of adapting therapeutic discourse to the patient’s culture . Fourthly, following comments from participants to decrease the burden related to the intervention, we decided that the place and time for delivery will be chosen by participants themselves. Hence, meetings can take place in a home or hospital setting. Notably, the program is focused on alleviating overload; thus, delivery mode should remain coherent with this concept . In addition, this more flexible framework fits better with the reality of psychological intervention practice in the day-to-day care of childhood cancer . Beyond the results themselves, we wish to highlight some methodological aspects of this study. The mixed methodology allowed us to generate a refined evaluation of the program and detail elements of strength and weaknesses. Using a brief survey at the start helped highlight the core topics to be addressed in individual and group interviews, thus allotting as much time as necessary to what seemed most important to the participants in the qualitative data collection. The qualitative data helped expand these responses by providing detailed justifications about opinions and examples. Moreover, collecting complementary points of view from both parents and professionals in separate meetings also helped enrich data by limiting the risk of self-censorship. Indeed, some comments including criticisms or worries clearly indicated that parents might have felt intimidated to speak openly about their relation to the clinic in the presence of the professionals, while professionals would probably have been more guarded not to hurt or offend parents if groups had been mixed. The qualitative dimension was not intended to confirm the statistical validity of the opinions expressed but rather to reach a level of depth, precision, and optimal reliability to guide changes and improvements to be made to the program. We must acknowledge some limitations of this study. Parents interviewed in this study were from the province of Quebec, Canada and spoke French. Although we had some diversity among professionals, it was not possible in parents, for feasibility purposes. It is possible that additional culturally anchored elements would have been identified as weaknesses if parents’ background had been more varied. We used social media networks to invite parents, which limits the participation to people who use this technology. We were also faced with the impossibility of assembling all parents in one focus group as originally planned in our study. However, we conducted individual interviews that led to a diversity of pertinent experiences. In conclusion, this study is the second step in defining a support program designed for parents confronted with pediatric cancer, TAKING BACK CONTROL TOGETHER. Having defined the program concept, we submitted it to end-users to assess its future relevance and acceptability, and improve the delivery mode and its tools/activities. Collecting information from end-users enabled us to engage in improvements to the program. The current version is ready to be pilot-tested. The future pilot will be focused on evaluating treatment fidelity and overall feasibility in a pre-post study conducted with parents whose child recently received a pediatric cancer diagnosis. It will also measure the change associated with the intervention. This work was awarded funding from the Charles-Bruneau Cancer Care Centre Foundation and CHU Sainte-Justine Foundation. The funding was made possible through a donation of Sobeys-Plaisir de mieux manger Foundation to DS, VM, DC, and SS. DO is a recipient of a postdoctoral fellowship from the Fonds de la Recherche du Québec – Santé (FRQs). DO, SS, and KP developed the intervention program and wrote the manuscript. SS and KP supervised the project. All authors helped write the manuscript and approved the final manuscript. DO is currently leading a research project as part of his postdoctoral fellowship which investigates the development and evaluation of an intervention program for parents in pediatric oncology. DO, KP, RR and SS designed the intervention program and conducted the preliminary evaluations. SS is the project director. The CHU Saint-Justine ethics committee approved the study. Committee’s reference number: 2017-1539. NCI. Bright IDEAS program [Available from: https://rtips.cancer.gov/rtips/programDetails.do?programId=546012. NCI. Surviving Cancer Competently Intervention Program (SCCIP) [Available from: https://rtips.cancer.gov/rtips/programDetails.do?programId=102875.